Sounds great! But as usual, we have to read to the end to find out that this is only available for recent releases of Android. How about adding a line at the top of your blog posts with details of which versions your new features apply to? Is it just me, or does it still open documents in the browser? If I set Docs as default, it just endlessly keeps jumping between the app and the Browser, prompting for the account. Docs Viewer and Editor are web-similar and very unuseful. There is no zooming for simple documents, only for sheets and images. Then I can't see docs in offline mode, only list of them. What is cache setting for? Offline viewing and editing are important features for me. But I like the trend. Thank you Google! I have been waiting for this for so long. However, to actually add value please add offline capabilities and built in editing. Otherwise, there is not much added value above and beyond simply opening Docs in the browser. I was excited because I do a lot of spreadsheet editing in Google Docs. The problem has been that it is next to impossible to edit a spreadsheet in a mobile browser on a phone so I was excited to see this app come out. Unfortunately it was a real let down. Editing the docs was just as bad as in a mobile browser, the cells still don't lock their position... I haven't found an advantage versus viewing in a browser. I'm uninstalling to get that space back on my Evo since the manufacturer was so stingy with on board storage, though I'll be keeping an eye out on this app for (hopefully) some great improvements! Please work on making editing files easier. I very much would like this for my tablet! Can you please integrate Google cloud print into this app? Does not work, It picks and chooses what it wants to convert and skips everything else. Does not even try to convert it. I tried it on a clear printed sheet of paper with Arial 14 font. I have been waiting for this forever, but this is disappointing. I wish this didn't use web viewer to edit! Looking forward to a meaningful update to this. At least its a start! Google Apps with my own domain is my default login, with a personal gmail login account as well. When I use my Google Apps, it keeps on asking me to select an account, tries to open, then asks me to select account... over and over. The gmail google docs works fine. Any ideas? can't find it on my market... is it because of my small screen resolution (qvga)? 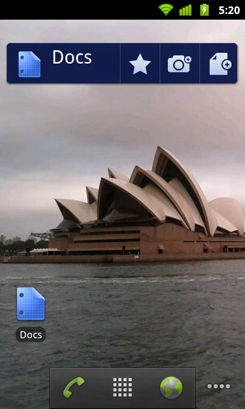 Is anyone having this problem on the Droid 2 for the doc scan feature: you hear the camera shutter go off, but then it just returns to the home screen. Thanks! Windows Phone 7 app, please! Could the editor be more "native", than embedded web editor? Please, please please! Excellent. I love being able to access my docs more quickly through the app! Hi, what is the smallest supported screen resolution? Thanks! 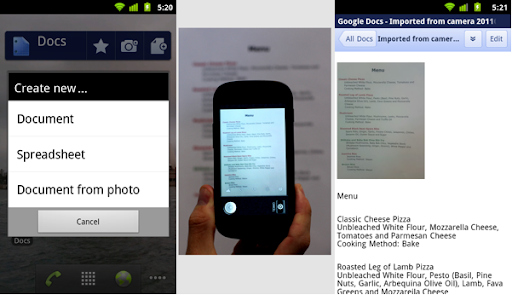 Almost every Google app supports QVGA resolution: why not Google Docs? Spreadsheet editing seems to be no different than just opening the spreadsheet in the browser. So the app is basically useless. How do I import a file that is an attachment in an email on my Gmail app? I love it! all my business documents at my fingertips and easily shared with customers and clients in any conversation! How do you use it as the default reader if you have quickoffice? This is soooo badass, thanks! Can some one clarify if this is compatible and optimized for Android 3.0? Are you sure this is not an April's Fool ? It just open the web editor, which FYI only works properly on 2.2 and not in 2.1. It's a shame to publish a beginner's lame app with the name of Google. Please delete it from the market and fire the team who made it (if it wasn't a one man's job as it looks). But for the record it works on QVGA on my U8110. Wow! This is pretty great. Thanks Google team, I've been waiting for this. 1) Some way to jump to the top of the document-- I've been using GDocs as a way to create a vet med handbook, but it's very long. The hyperlinks from the table of contents are great, but in the web version, I have a footer on every page linking to the top. I'd rather not have to manually enter a "top" link every so often. 2) Is there a way that you could have text input via microphone but without stopping at the first pause? This would be nice for transcribing messages communicated to clients on the phone directly into a document, instead of taking notes and relying on memory afterwards. Without offline support, this app is pretty much useless. I also have a Droid 2 and have the same issue as a user above. After selecting the option to take a picture of a document, the Droid 2 camera clicks a few times and then jumps back to the Docs homepage. What is more odd is that the camera continues to do that even after exiting Docs. A reboot is required in order to get the camera to function again. A bug fix would be much appreciated. I also am experiencing the problem on my Droid 2. I'd love to try out the OCR feature once this is fixed. Thanks. Like many others have commented, I was really hoping this would provide offline viewing and editing. It took a while to figure this out - even the reviews that are out there didn't seem to address the fact that this is missing the ability to view offline. To be honest, I really can't understand the benefit of having an app that gives me a list of my documents and then basically opens them in a browser. Great, but a "Rotate photo" would be useful. Can you make the Share option consistent with Android conventions? Share should bring option to email, etc. OCR is a nice feature, but please, let's get the fundamental basics working first, then add on the nice to have features. Please, make a Symbian version! could you please tell me what changes Google Docs android app does to Settings -> Accounts -> Other Accounts because after installation it ruined my Motorola Milestone 2!! It has replace Motorola Blur's google accounts handling with Google's android default google account handling to add Google Docs sync feature but this change ruined ALL the SYNC system of Milestone 2 phone!! Gmail push notification (and autosync) is not operate at all!! Calendar and Contacts autosync too!! MotoBlur has more flexible google accounts sync options. I can choose for each google account if I want to sync only contacts on one account or only gmail on second one etc!! 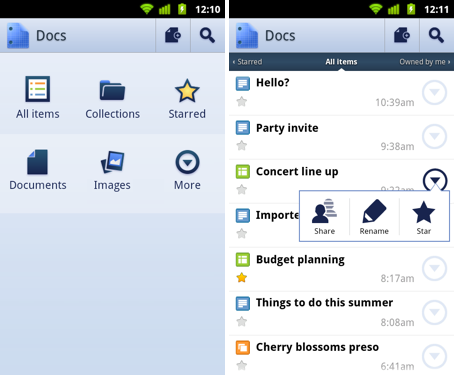 I have uninstalled Google Docs app but the Motoblur google account handling didn't came back!! Could you please tell me what system settings package I must restore from a previous Titanium backup to get Motoblur's google account sync options back?? Sync options of Google Accounts settings disappeared because autosync button in Power Control widget was off! I'll try to install Google Docs app again and check sync functionality! The app is quite good but I mostly use it for quick edits of a spreadsheet I have. When I try and select a cell, it pauses for a second or two and then highlights the entire row, which is by design but really annoying, especially the pause. Why can't I just edit one cell like in every other spreadsheet editing program? It also seems to be quite innacurate in terms of where I tap. I have no problems with this in any other app including spreadsheet editing in ThinkFree Office. Can't move to SD. Lame. No thanks. I've changed my mind, I can't stand this app! In addtion to the problems above, I can't open my documents when I don't have signal. There is an option to set the amount of cache - what is it caching? Surely it should just work like offline files! Uninstalled!! Can't edit cells with formulas in spreadsheets. Sure glad I checked this before relying on it!